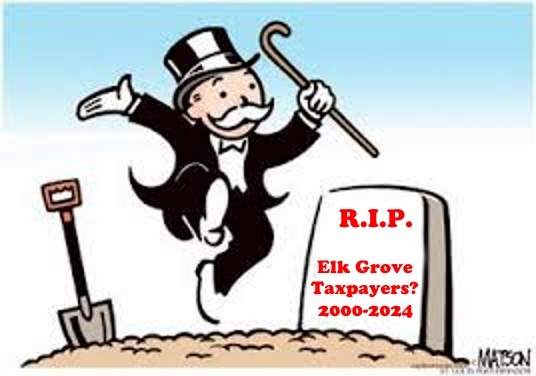 The following is an open letter to the Elk Grove City Council as public comment for the September 23, 2015, Elk Grove City Council meeting and was submitted to Elk Grove News as an Op-Ed. As an active citizen of this city, I along with many others, are very concerned about the future spending the Elk Grove City Council is about to undertake. The City is in moderate shape financially. We certainly don’t have the 52 million dollars in reserves we received after we first incorporated. And for those of you who don’t know, we got that money because citizens stepped up conducting a voter registration effort. Many involved citizens including Sarah Johnson, Dannetta Garcia and Roy Herberger ensured that our infant city had “money in the bank.” [The City received $1,400 per new registered voter – so do the math, $52 million is a lot of new registered voters. And what made this effort even more compelling and daunting was that those voters had to be registered within a certain timeframe for the City to receive the money.] However, that money is long gone because the original Council spent a lot of that money foolishly. Being able to erase foolish spending decisions made in more prosperous times was a tempting proposition, and that is exactly what they did. So what is left 15 years later. . . nothing! I urge you to take a step back and make a list on one piece of paper. List of all of the projects on the drawing board and next to it the amount of money needed. Don’t bury numbers in staff reports or in tables that are difficult to decipher. Make one list and underline the bottom line! What I don’t understand is that you already know that the aquatics center project is six million dollars short. Have you addressed from where that money is coming? Yet on tonight's agenda is the potential to spend upwards to $57 million. The Council also needs to repay the drainage fund six million dollars. The Council seems to be on a serious spending spree. Many people are afraid, and are warning, that this Council is putting Elk Grove on a path to bankruptcy with all of the future spending. The City already has seen some shortfalls and continues to be unable to fund some services such as the road maintenance. Additionally, the Elk Grove Police Department employee contracts will be coming up for renegotiation. And now we have the potential of new projects running millions of dollars into the red each year. The spending on all these projects should solicit concern for the future fiscal condition of our City and it has by those of us paying close attention. In particular, the City lacks designated reserves for several significant liabilities, and in my opinion, the City currently is not keeping track of all reasonably foreseeable future liabilities because everything seems to be based on assumptions. The citizens of the city of Elk Grove have a right to know, in clear, concise language, and not rhetoric, exactly how you are going to fund all of these projects. After all, we will be the ones paying the bills, isn’t that correct? As long as the Council Chambers remain empty and they keep running unopposed and getting re-elected, they will take that to mean they are doing a good job. Excellent discussion on how Elk Grove is lining up to become the next Stockton. Watch all the self entitled rug rat soccer players come out in force for the council meeting. Elk Grove, the city that knows how... to become the dumping ground for hair brained projects and thousands of cheap houses on postage stamp sized lots accompanied by over 3,000 units of high density low income housing. Since the OpEd has been posted, I have been contacted by several citizens who also were involved in the voter registration effort thanking me for remembering what they did to make certain our city got off on a good financial foundation. I would say so; $52 million dollars back in 2000! But what I didn't put in the Op Ed when I referenced the time frame because I couldn't remember the exact number of days is that all of this was done in 24 days! These amazing people got over 37,000 people registered to vote in 24 days so our city would be eligible for the $52 million dollars. That is unbelievable to me. However, knowing most of the folks involved, on second thought, they could move mountains if they put their collective minds to it, and it appears they did! I was pleased to see at Wednesday's council meeting a strong voice of reason in Vice Mayor Pat Hume set the tone for the decision to scale back the soccer complex project, and if the soccer complex is to be, the people will decide if we want to take on the debt. Excellent public as well comment by Mike Monasky, Lynn Wheat, Suzanne Pesci and former Elk Grove Planning Commissioner Paul Lindsay!